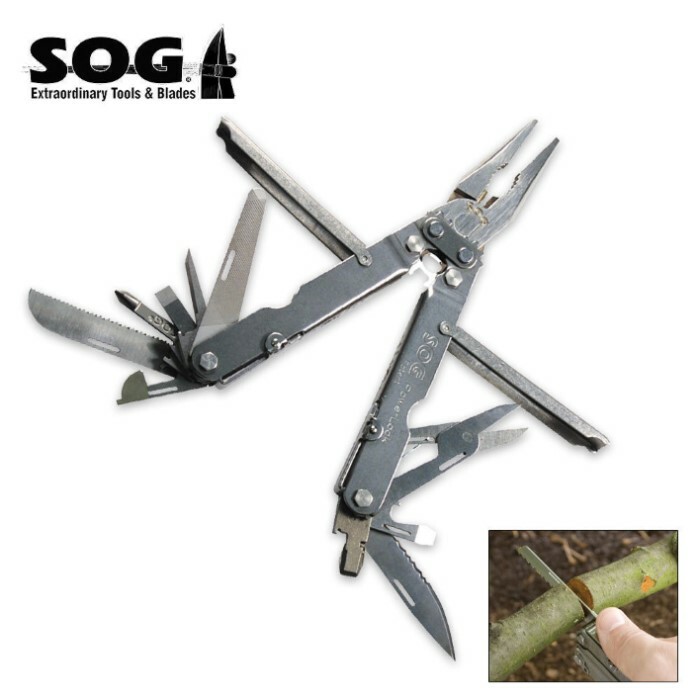 SOG Powerlock Plier Multi Tool | BUDK.com - Knives & Swords At The Lowest Prices! Driven by SOG's exclusive interlocking gear system, Compound Leverage has become a SOG patented trademark in folding tools. It truly allows miniaturization of traditional larger pliers by providing increased leverage. With every pound of pressure applied at the handles, twice the power of conventional designs is generated in the pliers, therefore minimizing the amount of hand pressure that is required to get the most torque out of your tool. This mechanical advantage is known mostly in the trades by people who use their tools every day. The PowerLock features removable, pivoting handle covers that improve the comfort profile for your hand. Length opened 7", length closed 4.62"